I am going to review one more Fruttini product today. I had reviewed the Fruttini Ginger Passionfruit Body Lotion before. 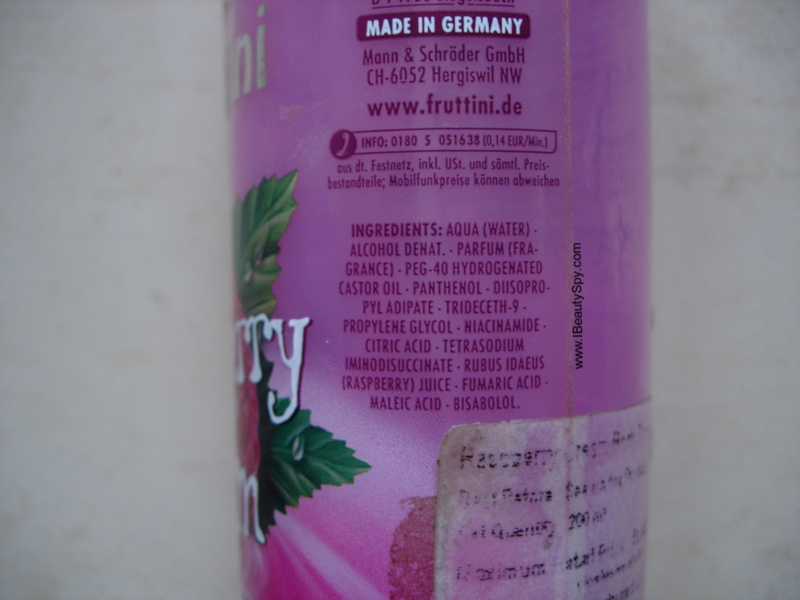 All fruttini products contain real fruit extracts. They have so many variants like Cherry Vanilla, Cranberry Choc, Coco Banana, Milky Orange, Raspberry Cream, Peach Pear, Strawberry Starfruit, Lime Mint and Pineapple Prosecco. Sounds delicious, right? 😀 So let’s see how Fruttini Raspberry Cream Body Spray fared on me. The fruity sweet fragrance of raspberries and delicious cream whets your appetite for the day to come. Real raspberry extract and moisturising care elements caress the skin. I actually got this thinking it to be a body lotion. Didn’t read the label properly. It was only after receiving the product that I realized it was a body spray . I was kinda disappointed since am very picky with fragrances. I feel the kind of fragrances you wear can reveal a lot about the person. So I was not much enthusiastic to try this. When I finally made up my mind to give it a try, I was very disappointed. 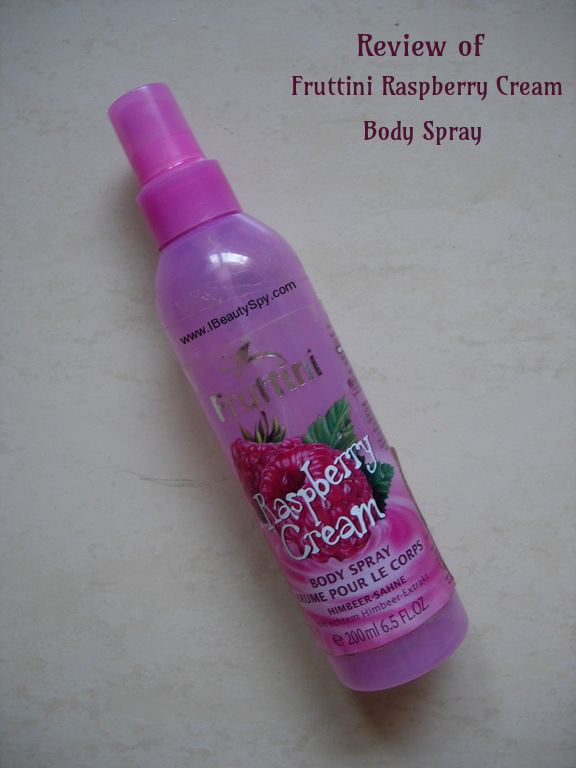 Fruttini Raspberry Cream Body Spray comes in a fun, transparent pink packaging. I like the packaging of all Fruttini products. They are attractive and fun. Fruttini Raspberry Cream Body Spray has a sweet, fruity scent with a little bitterness to it. Maybe that’s how raspberries and cream smell in real. I have never seen a raspberry, let alone eat it 😅 . Those who love very sweet and fruity scents will love it. But I didn’t like as I felt it was too strong and sweet for me. Not my kind of fragrance. The lasting power of the body spray is also very less, hardly lasts for 1-2 hours. But when you spray it initially, it is very strong. What I like about this was that it contains real raspberry juice. But I wish it was a body lotion instead so that I would have finished it up. I like fruity scents in body lotions, body butters and face washes but not in body sprays. Also it contains alcohol, so if you are someone who prefers alcohol-free sprays, this is not for you. The quantity of the body spray is good and would last for a long time. I find it to be an affordable body spray but the only sad fact is I don’t like the fragrance ☹. * Contains real raspberry juice. * Attractive and fun packaging. * Strong and sweet, fruity scent. * Lasts only 1-2 hours. Only if you like strong, sweet, fruity fragrances. Fruttini Raspberry Cream Body Spray sounds interesting with a nice combination of raspberries and cream. However, the fragrance is not my cup of tea. If you like strong, fruity scents you can give it a try, else skip it. Have you tried any Fruttini products? Do share your experience in the comments below. Nice Review. Never been a huge fan of fruity smelling products.